Edited by Jerry Proc VE3FAB [email protected] Web: http://hmcshaida.ca/ HMCS HAIDA Naval Museum, Toronto Ontario. Most of us will never encounter any mildly radioactive substances during our daily routines, but the subject always fascinates me. David Stinson, a collector of military radio gear presents a short essay on the hazards of radiation from a unique perspective. One thing working many years at the Nevada Test Site taught me about was ionizing radiation. 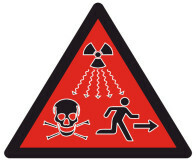 Our society has been so blasted by the media about ionizing radiation that it engenders more fear then it should. Handling radiation is similar to handling fire. In fact, heat from fire is radiation - it's just at a different wavelength. Ionizing radiation deserves the same respect as fire and can be thought of in similar ways. A small radiation source is like a small fire and a large one is like a large fire. You wouldn't run screaming from a lit match, but neither would you stick your finger on it. This is like a "small" source, such as the front panel markings of a military radio receiver. On the other hand, I would certainly get away from a few grams of say, Cobalt 60. That's a LARGE source and should be treated like a forest fire - meaning RUN! There is no need to be nervous if you arm yourself with the proper knowledge and respect, just as you would for fire. The radiation levels emitted by some military gear and aircraft instruments are not threatening with normal use even if you are sitting in close proximity. To give you some perspective -- the "hottest" rig I have is the thick radium paint on the BC-9 meter. It's about 10 millirem/hour when measured right slam-up against it. Every inch away from it reduces that level drastically. 10 millirem/hour means if you put this radioactive source in your pocket so it was against your skin and carried it for an hour, your leg would receive ten thousandths of a REM dose. Assuming non-ingestion, it takes a 100 REM whole-body dose (100,000 millirem) to a human population for 50% of the people to show any effect, and that is detectable only through blood tests (change in white cell count). Ninety percent or so of those detected will recover without proven lasting effects. There are people who will argue theory about injury from small doses, but my data comes from real world evidence. People in Denver Colorado receive much higher whole-body doses all their lives with no detectable increase in disease in the overall population since their elevation removes more than a mile of radiation-absorbing atmosphere above their heads. That having been said, the important threat is inhaling or ingesting the stuff. This is a real danger that should not be taken lightly. Radium lodged in the lungs or digestive tract means a serious increase in the chance for cancer, because it sits there for a long time bombarding the same set of cells. The best way to handle radium paint that isn't flaking is: LEAVE IT ALONE. However - Hams have a generic inability to keep screwdrivers out of things, so there are times you might need to open your equipment for maintenance. We handled this problem at the Test Site by using ventilation tables and by paint fixatives. When handling small items, we put them on a table that had vent holes in the surface and a vent hood on top. A steady current of air carried any loose particulates up the vent and into a filter system to trap them. Down in the tunnels, if there was any fear of active particulates, we would spray the walls and surfaces with a paint fixative to trap them on a surface. Again - casual contact on a surface won't hurt you; ingestion will. Since all or most of us don't have vent tables available, here are my guidelines for working with very low level radioactive materials. 1. NEVER eat, drink or smoke while working with radioactive items. 2. Work only in a well-vented area like a garage with the big door open. Don't work in the house where people can be exposed. 3. Place a fan blowing gently ACROSS your work area toward the outside. This will blow any particulates away from your lungs. A fast breeze will just create eddy currents. Make sure the path to the door is clear so no eddy currents carry particles back to you. Radium is heavy and wants to sink to the floor. Let it. If you don't want to do this, I very much recommend at least a painter's cloth breathing mask. 4. Wash your hands with soap and water when you're finished. 5. The best way to clean a radium-painted surface is DON'T! But people will. Remember that any brushing, wiping or scrubbing you do WILL pick-up particulates. You now have a radioactive cleaning cloth. Good luck with it. 6. DON'T attempt to remove the paint to "get rid of the problem." You'll end-up with LOTS of particulates and run a serious risk of contaminating yourself and everything around you, not to mention creating a waste product for which you could go to jail if you were to throw it in the household garbage. Sealing exposed radium paint on surfaces like the a TBX transmitter or The Wireless Set No. 19 with clear-coat should be a good idea. I've never personally had to do this. I would ask the experts because, if you use the wrong paint, the clear-coat could eventually flake off the aluminum and carry the radium with it. Someone out there knows which would be best to use. We thank David and Jerry for bringing this vital issue to our attention. Copyright © by Bob Cooke VE3BDB. All rights reserved. No reproduction in any form is permitted with written permission.